As I have been predicting for quite some time (see: The Truth About Home Prices), housing prices are declining again in the aftermath of the second ill advised "first time home buyer tax credit" (should be renamed "Fool's Gold Part 2"). 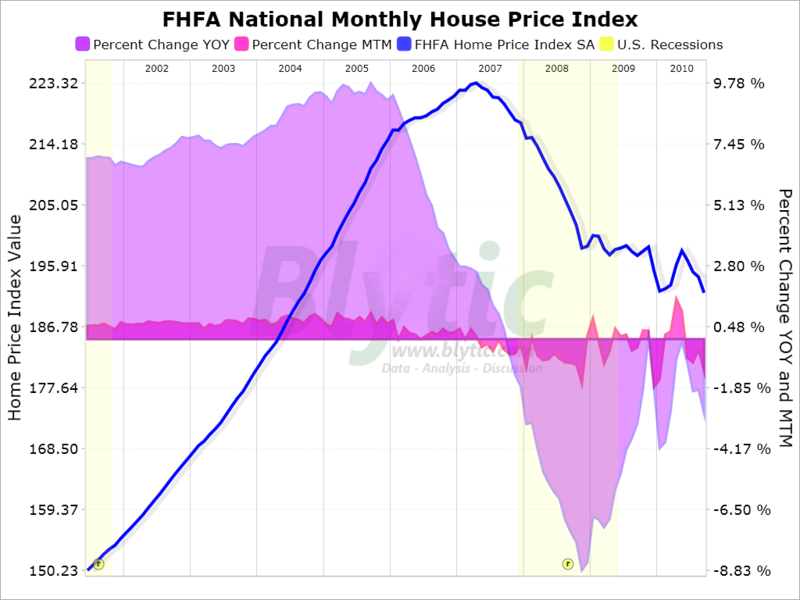 According to this article, FHFA Monthly Home Prices: September 2010, home prices have now fallen below their levels in September 2009. (The article states: "The FHFA monthly HPI are formulated from home purchase information collected from mortgages that have been sold to or guaranteed by Fannie Mae and Freddie Mac."). As you can see by the graph above, the home price trend clearly shows that home prices are declining again. As a result of this further (and expected) housing price decline, there are going to be an elevated level of foreclosures, short sales and other distress sales over the next several years. Due to these issues, the overall poor economy, and the fact that home prices are still historically high, housing will not begin recovering for at least 4-5 years and even then price gains will be very modest.